We passed the Employment Equality Act here in Ireland in 1973. 36 years later, we are still a long way away from a workforce that could in any way be described as equitable and the same holds true across many developed world countries. 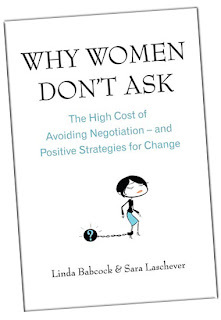 Linda Babcock and Sarah Laschever have some very interesting ideas on this topic and I was asked to discuss some of the points raised in their current book, Why Women Don’t Ask, by the nice folks on Dublin’s Q102. Is it chauvinism? Misogyny? Fear? Societal mores? Conditioning?